I missed last month but today I once again join Christina of Creating My Own Garden of the Hesperides for Garden Bloggers Foliage Day (GBFD). To my dismay after many attempts I do not have deep or wide vistas where foliage is the main highlight, so I will concentrate on the foliage of individual plants. After seeing how other gardeners rely on Brunnera, I added this silvery-leaved plant in spring and am pleased with the way it brightens up a dark corner. 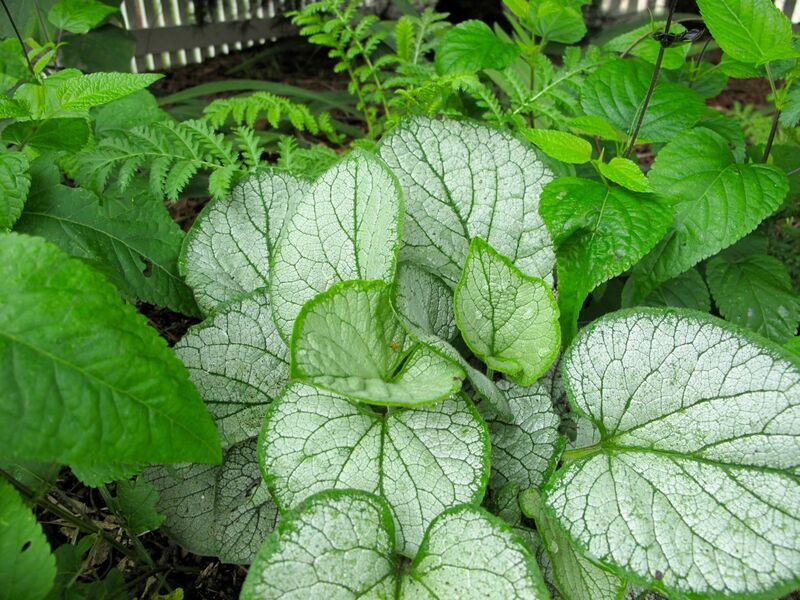 Its name is Brunnera macrophylla ‘Silver Heart’ (False Forget-Me-Not). Helianthus angustifolius (Swamp Sunflower) is towering above the western border, adding welcome height and structure to that area. 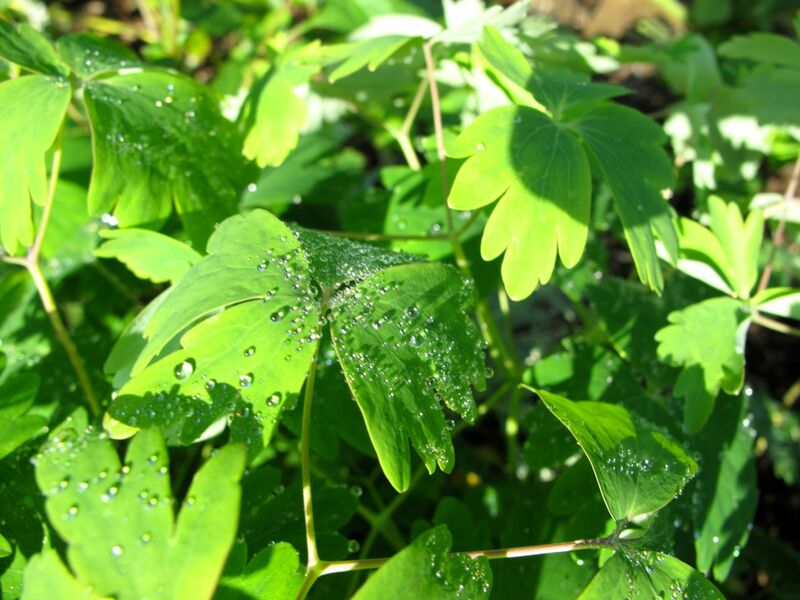 Aquilegia canadensis (Eastern red columbine) flowers profusely in spring but its foliage is attractive all summer. Here it is still covered in early morning dew. 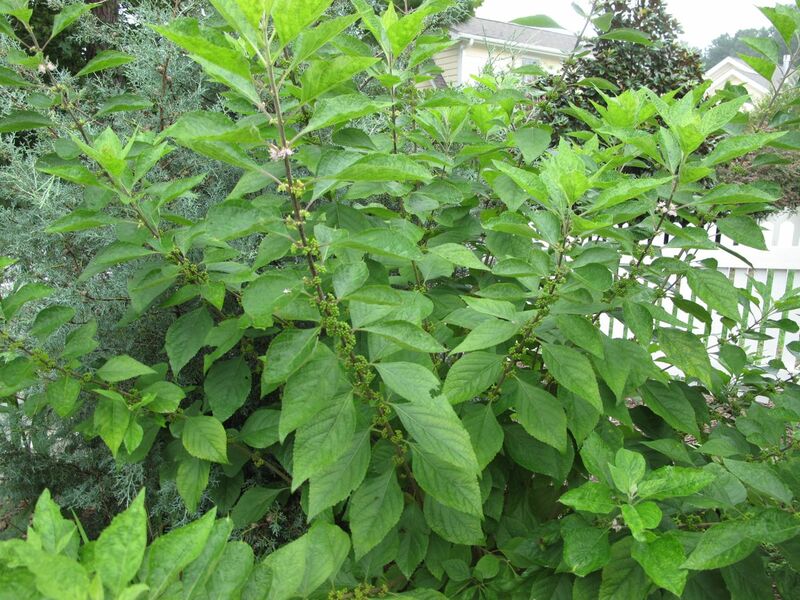 The native Callicarpa americana (American beautyberry) is forming flowers and will make a delicious meal later in the fall when the berries ripen to teenager purple. 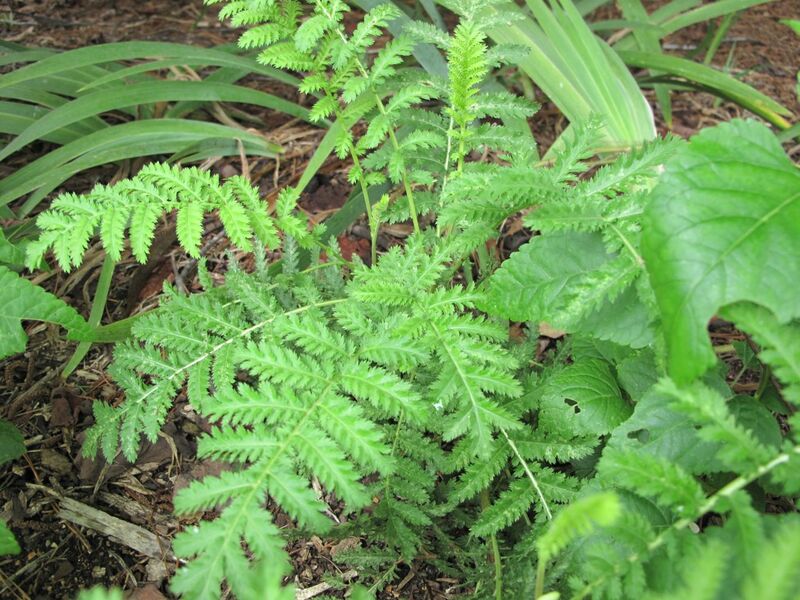 The fern-like leaves of Tanacetum vulgare (Tansy) add nice textures to the border. 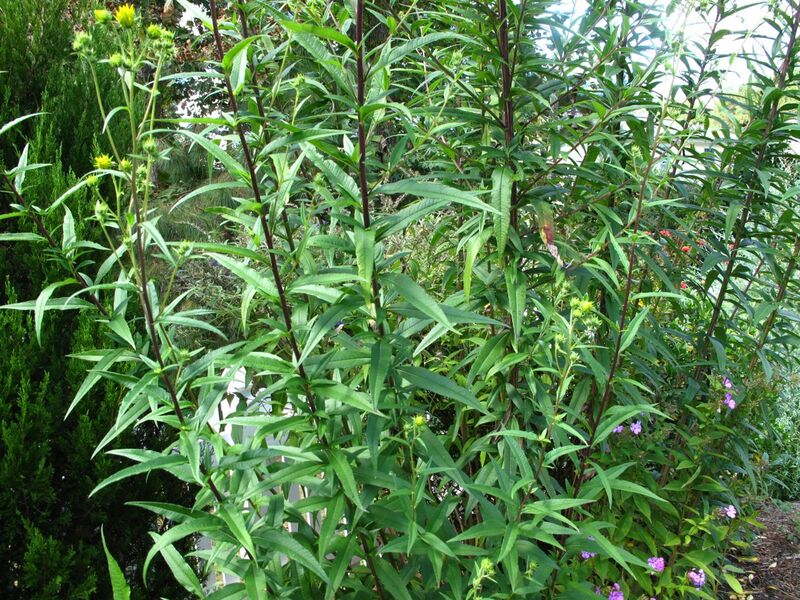 This plant is very aggressive, but I have learned to be aggressive in pulling it out when it wanders too far. Near the Tansy, something is eating the Ageratum. It has looked like this most of the summer. Most years I try to pull up the Ageratum so it does not overrun the border, but I have not been attentive enough to the garden this year. A few remain and the purple flowers will provide some relief to the autumn border. This is the first year the leaves have looked so poor. 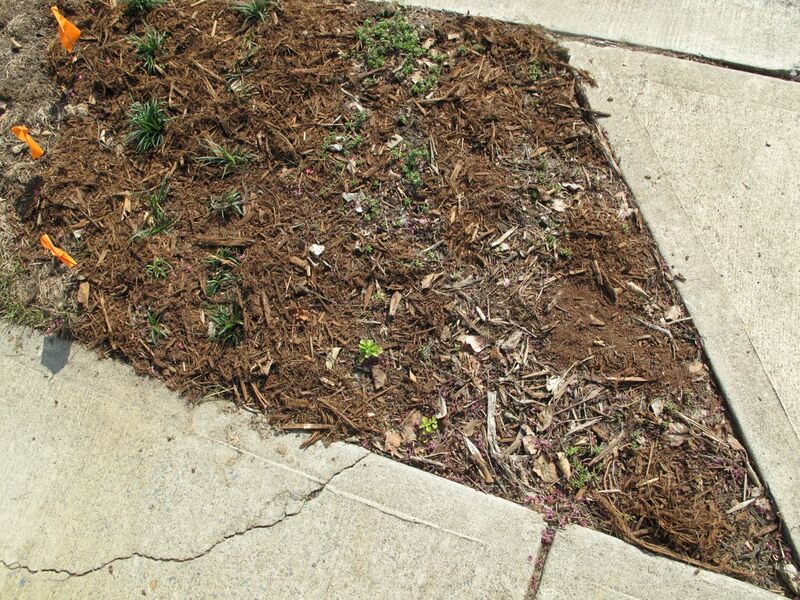 In spring I began planting sedum in the hell strip between the sidewalk and the street where the grass refuses to grow. The sedum has not performed spectacularly but I think it is very slowly filling in. 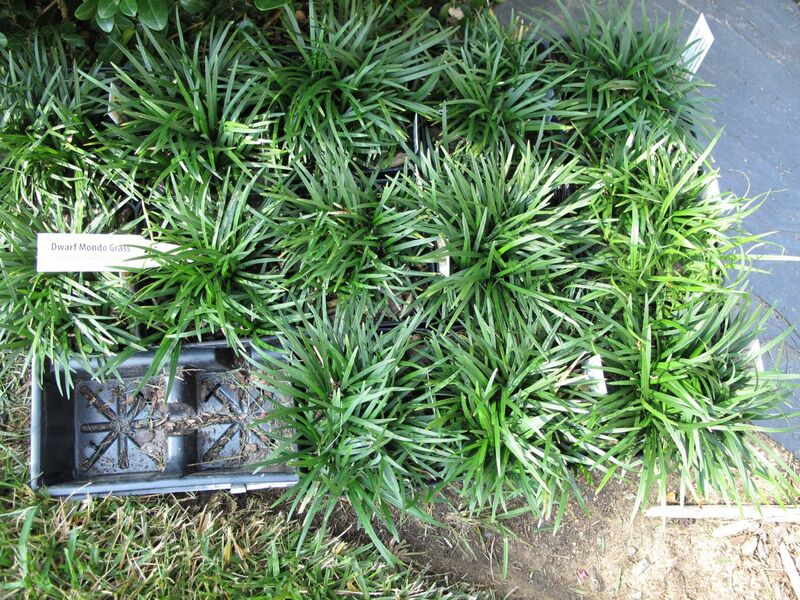 Before the homeowners association sends us a letter this fall telling us we need to replant our strip, I tried to get ahead of the game by also planting Ophiopogon japonicus ‘Nana’ (Dwarf Mondo Grass) . It has been so miserably hot since I bought it last week I could only manage to get a small portion of it planted so far. 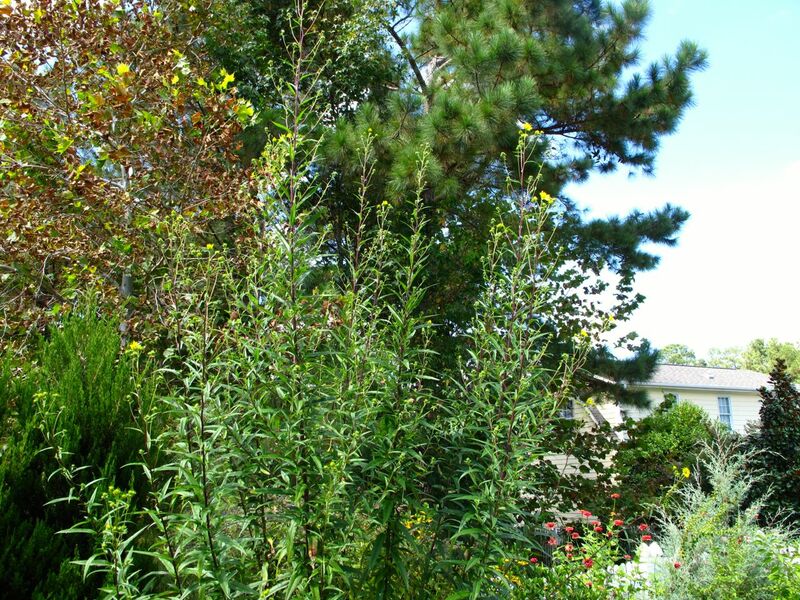 Also near the street is a small planting of shrubs encircling crape myrtles. 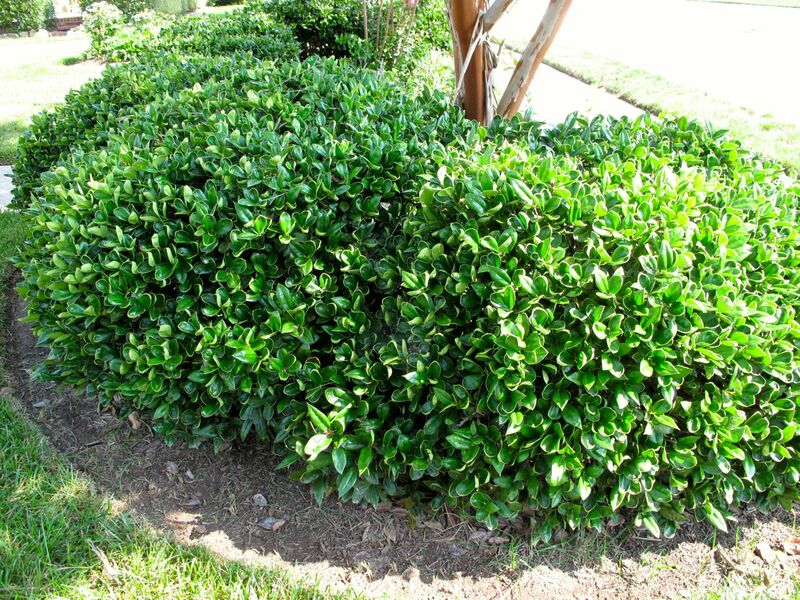 I would very much appreciate it if someone can help identify this shrub. 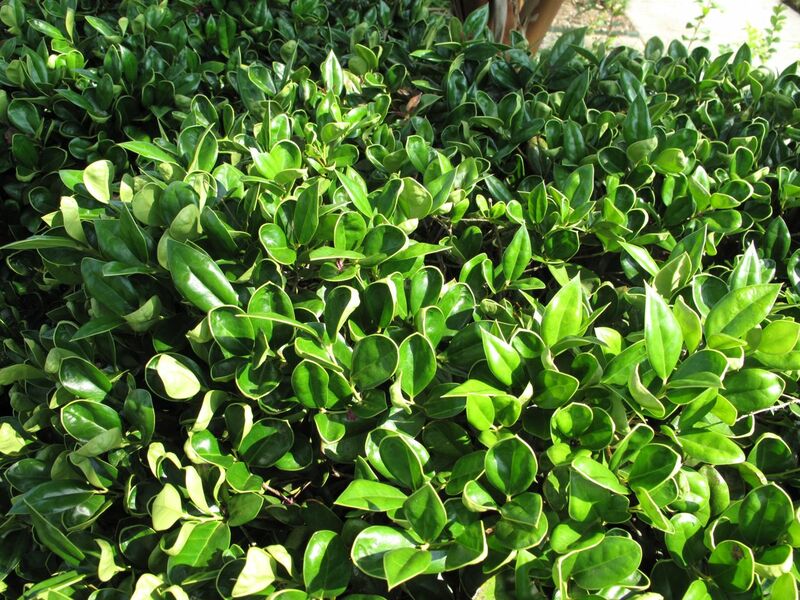 It is not one I love, but it requires very little maintenance and survives rain or drought equally well. Visit Christina at Creating My Own Garden of the Hesperides for more Garden Bloggers Foliage Day features. 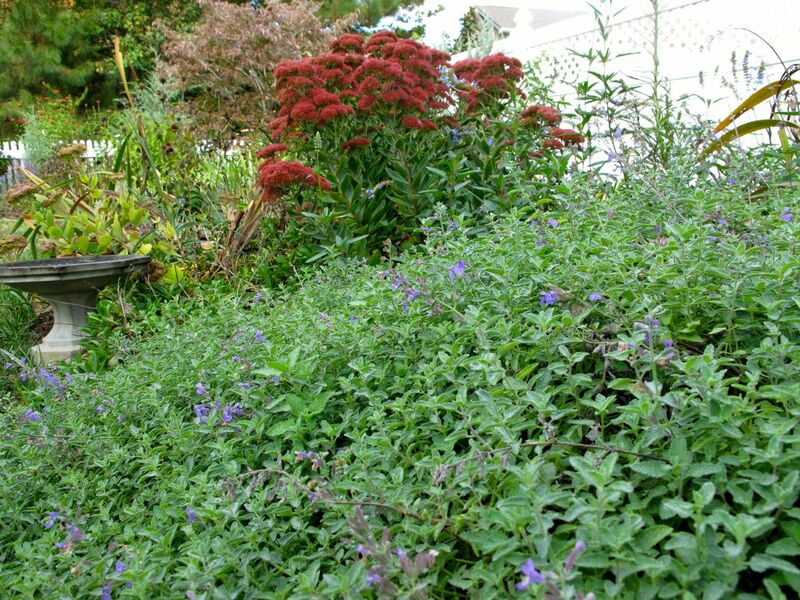 This entry was posted in garden and tagged ageratum, Aquilegia canadensis (Eastern red columbine), brunnera, Callicarpa americana (American beautyberry), foliage, GBFD, Helianthus angustifolius (Swamp Sunflower), Ophiopogon japonicus 'Nana' (Dwarf Mondo Grass), tansy on August 22, 2014 by pbmgarden. 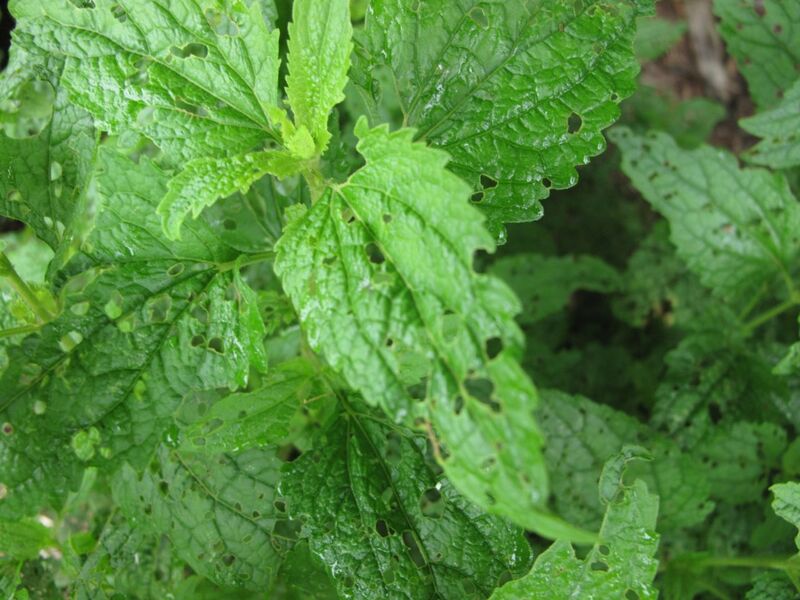 Can we say that plants have senses? 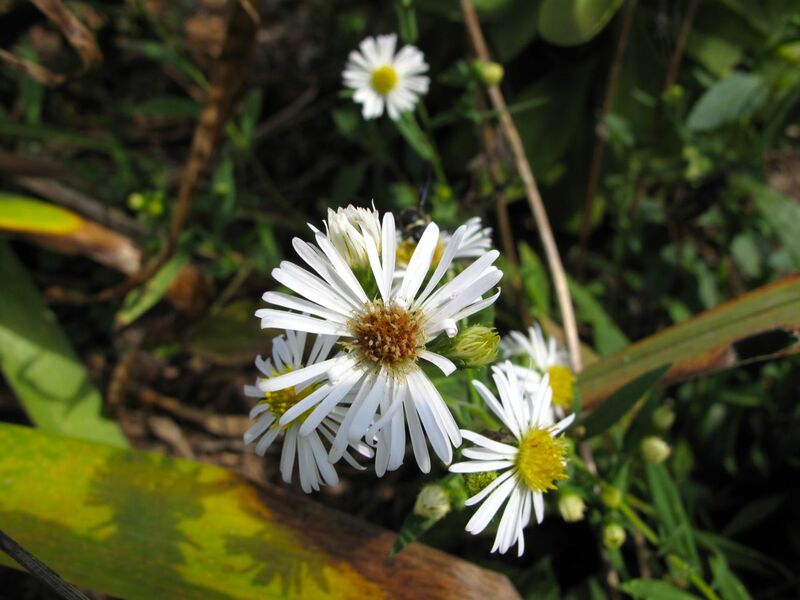 How do plants sense their environment and how do scientists study plant senses? These are questions I am exploring for the next few weeks in a free, online class entitled What a Plant Knows (and other things you didn’t know about plants). The class is taught by Tel Aviv University Professor Daniel Chamovitz, who wrote a book by the same title. The class began last week and I am enjoying it so much I wanted to mention it here. It is not too late to start the course, offered through Coursera, a company that offers massive open online courses (MOOCs). We finally had much-needed rain this past week and even now there is a fine mist. It is cool 68.7 °F and gray, the opposite of last weekend when we had clear blue sunny skies and temperatures in the high 80s. Last Sunday I helped with a neighborhood plant swap. It was heartening to see the turnout of people (including some children) interested in sharing plants with each other. I shared Monarda, Hedychium coronarium, and Penstemon digitalis ‘Husker Red’ and in return, I could not resist some reblooming Irises of unknown color and a white peony, Paeonia Festiva Maxima. Today I found several rebloomers flowering in the garden. 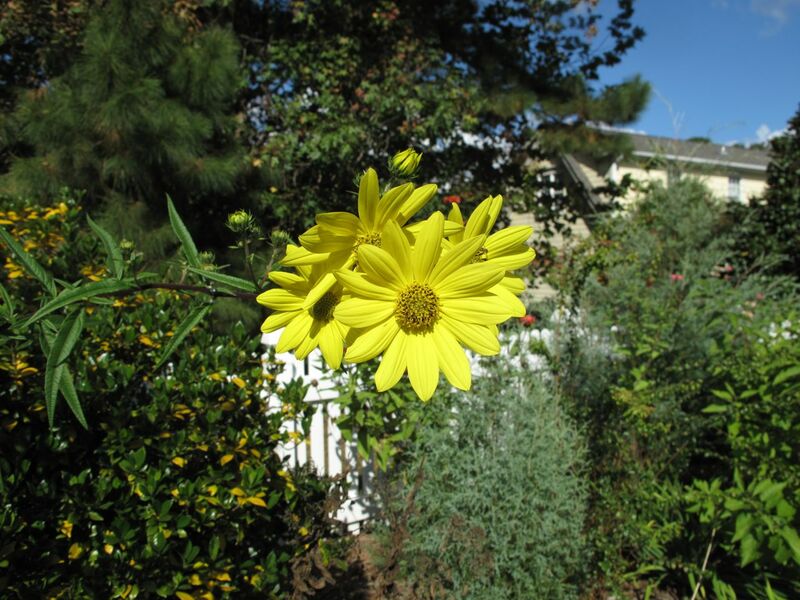 The Swamp Sunflower continues to tower over the back border. Today it was covered with bees. On Thursday during a cold, heavy rain I spied a hummingbird stopping in to visit along the top of this plant. The hummingbirds are gone now and no more Monarchs ever showed up, just that one. The Sedum gradually is turning brown now. The last time I photographed it a big grasshopper was sitting on it. No way to know if this is the same one but it looks completely cushioned by the tiny flowers. 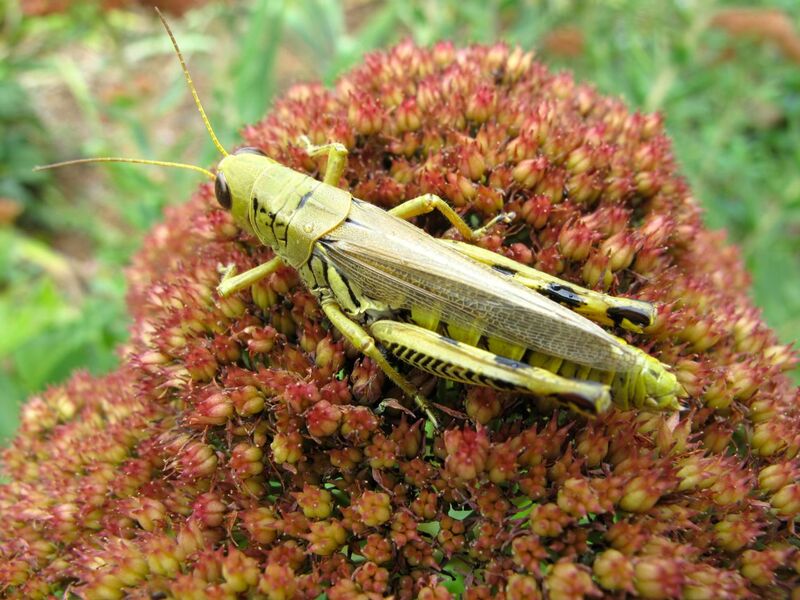 This entry was posted in garden and tagged almanac, Autumn Joy Sedum, coursera, Differential grasshopper (Melanoplus differentialis), echinacea purpurea, German Bearded Iris, Helianthus angustifolius (Swamp Sunflower), iris, purple coneflower, What A Plant Knows on October 12, 2013 by pbmgarden. As September 2013 winds down I have some photographs and notes to record, which I will break down into several posts. This evening, Saturday, at 6:20 pm the temperature is 68.7 °F. The sky was deep blue today, breezy, with lots of big clouds moving in and out—simply a gorgeous day in North Carolina. Early in the morning I walked around the borders, inspecting and taking pictures. For the first time in weeks no mosquitoes bothered to chase me back indoors. The significance of this cannot be overstated as the mosquitoes have been numerous and fiercely aggressive. For the most part this has been a dream year for gardening. A long cool spring accompanied by plentiful rainfall kept the borders happy throughout the summer. Usually by now most of the garden is brown, but this year things are easing along. That could change soon though because the entire month of September has been very dry with only a couple of rains to bring relief. Benefiting from the supportive weather this year, Nepeta ‘Walker’s Low’ has been an unusually strong performer in the northern border. Sedum ‘Autumn Joy’ has deepened from its earlier pink into a rich terra cotta, almost burgundy color that I really like. I plan to keep that color in mind when adding new plants. 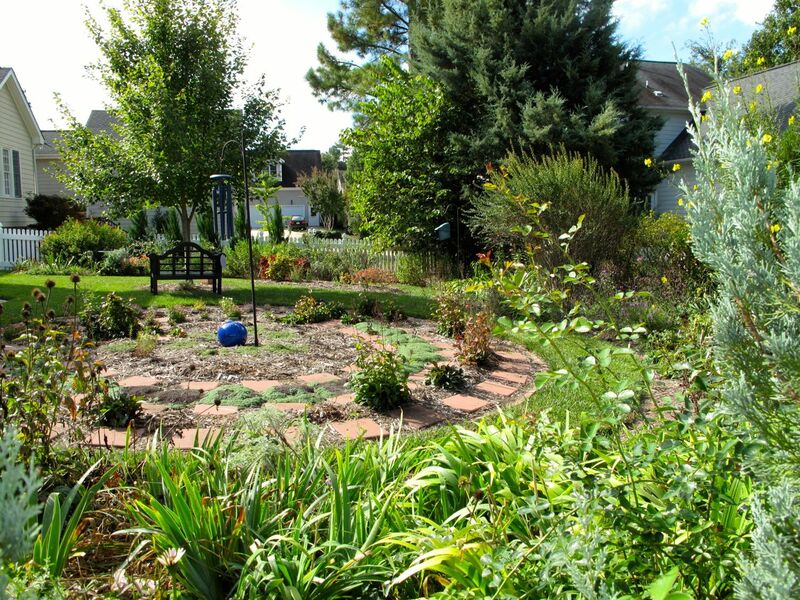 I do not have color-themed gardens but would love to come up with a red border at some point. Today I did no gardening, but instead was fortunate to enjoy the garden with a friend. After 75 minutes of walking around the neighborhood and lake paths, we returned home in early afternoon, taking time to sit and rest on the garden bench a while before walking the meditation path. During our time in the garden a gentle breeze frequently stirred the wind chimes, augmenting the enjoyment of a peaceful time. In the five days since I last posted, the Helianthus angustifolius (Swamp Sunflower) at the back of the western border has opened up more fully, commanding attention and drawing comments from husband, visitors and me throughout the week. 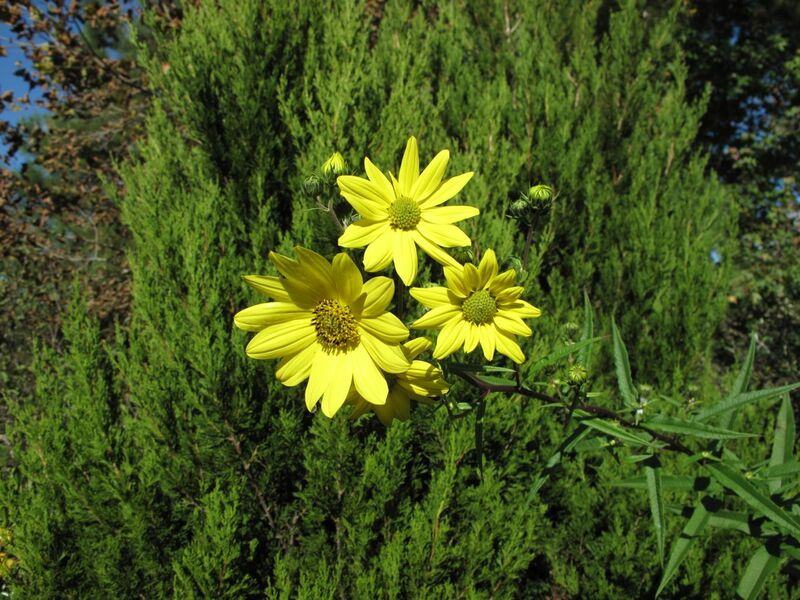 The yellow flowers glow cheerfully, almost gaudily like neon. The design of the garden is gradually improving, but still needs major vertical focal points. 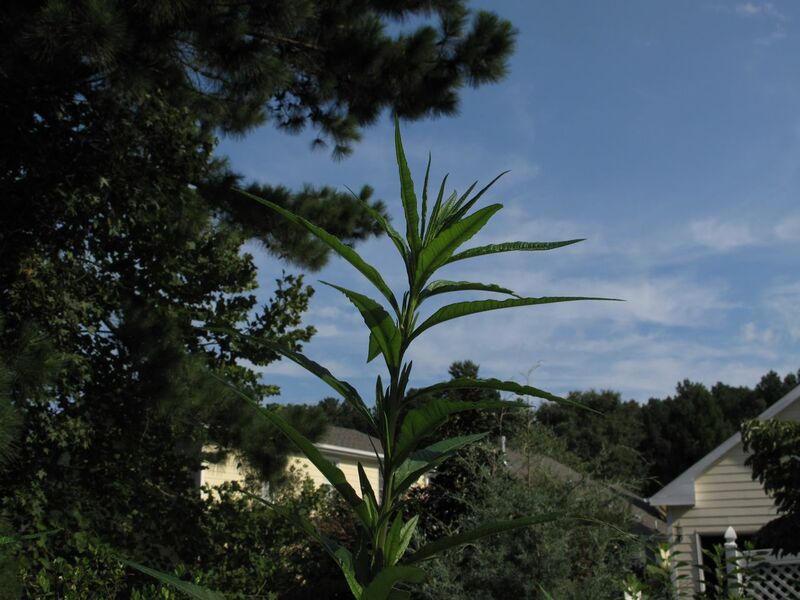 To see the strong stems at the center of the Swamp Sunflower lifting up toward the sky is very satisfying. The neighbor’s Sycamore, upper left in the photo above, has suffered most of the summer (I think from a fungus). With the arrival of fall the brown leaves look more appropriate. 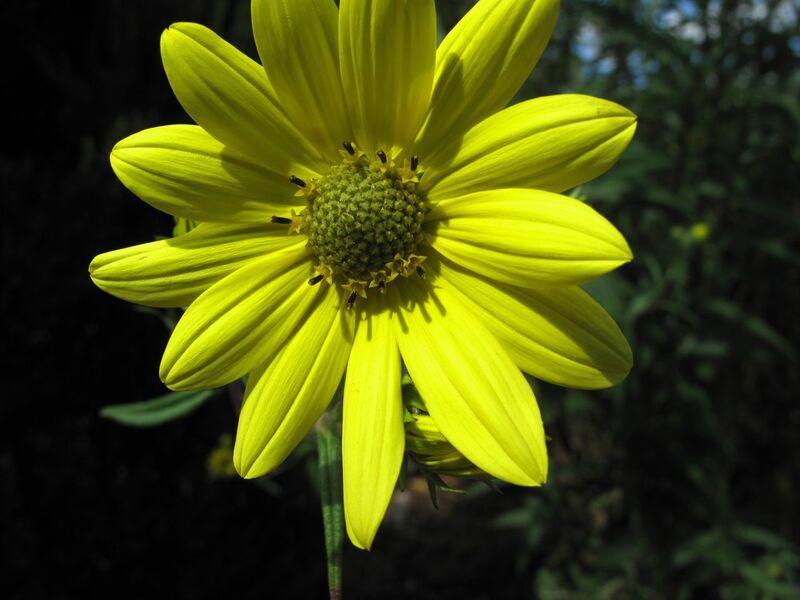 For some reason the branches at the sides of the Swamp Sunflower are much shorter than at the center and arch downward. I wish I could be sure of the two trees behind the Swamp Sunflower, seen in the picture above. They grew in pots near the front steps for a couple of years before I planted them in the garden. For a time I thought they were Italian cypress, but now I think they might be Juniperus chinensis ‘Spartan’ (Spartan juniper). Whatever the kind, they have grown beyond their expected width and merged together. 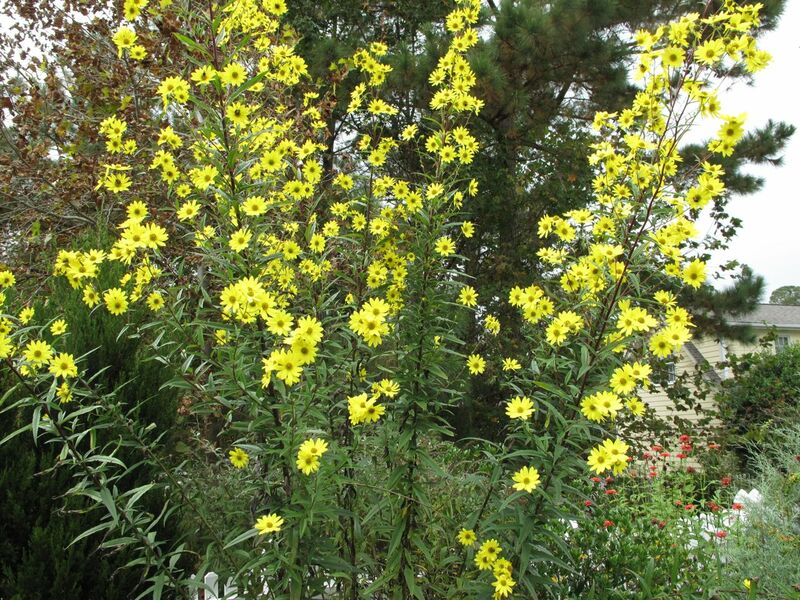 This entry was posted in garden and tagged almanac, Autumn Joy Sedum, garden almanac, garden journal, garden photography, Helianthus angustifolius (Swamp Sunflower), meditation circle, meditation path on September 28, 2013 by pbmgarden. 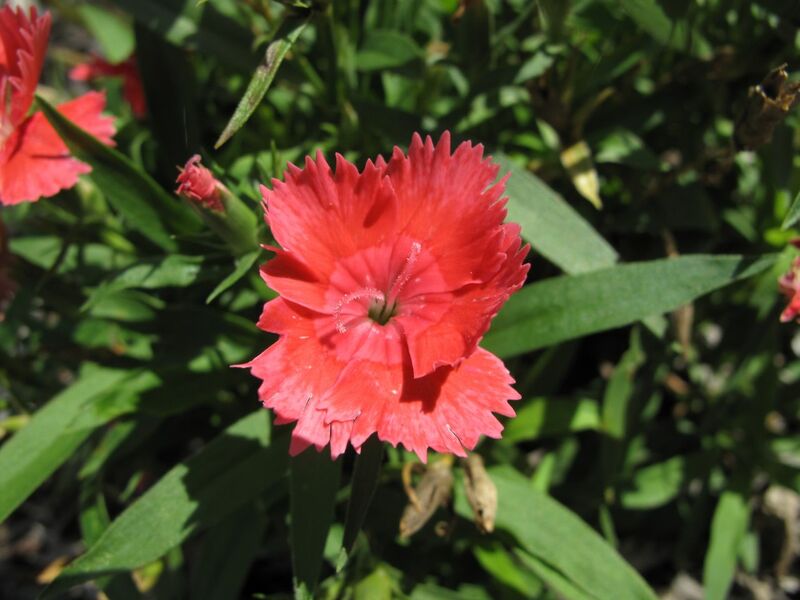 There are several new notables in today’s garden. 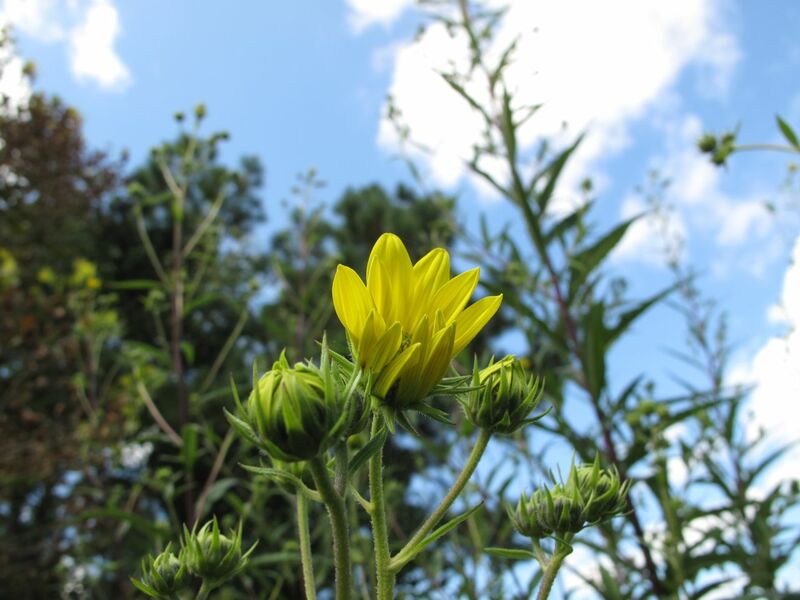 The Swamp Sunflower has grown way up into the sky, reaching ten feet or more during the past couple of months. 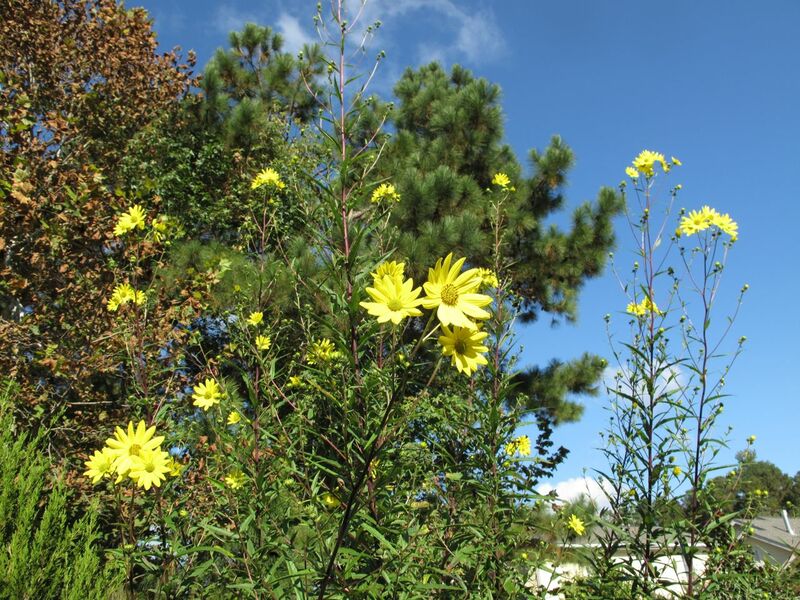 Today, the first full day of autumn, a few of the yellow flowers finally emerged. 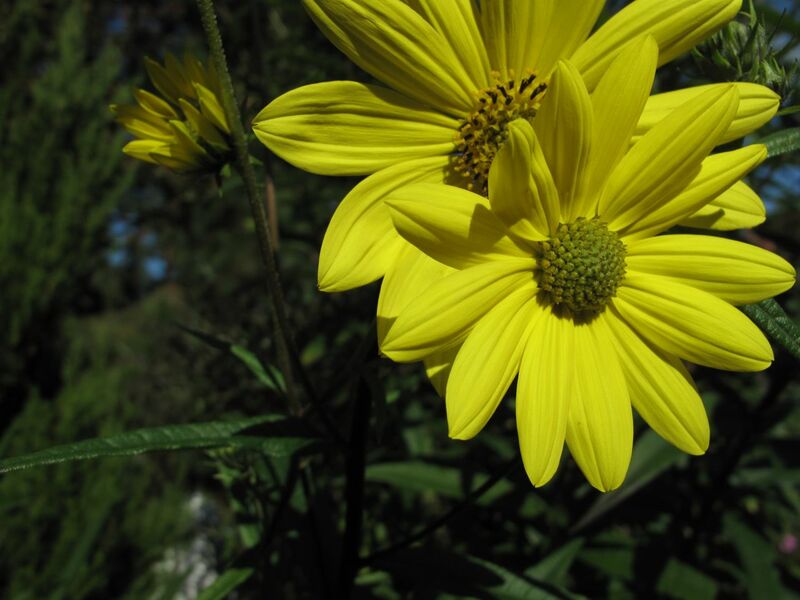 This Helianthus is a native plant but it can spread aggressively so I try careful to watch it closely. 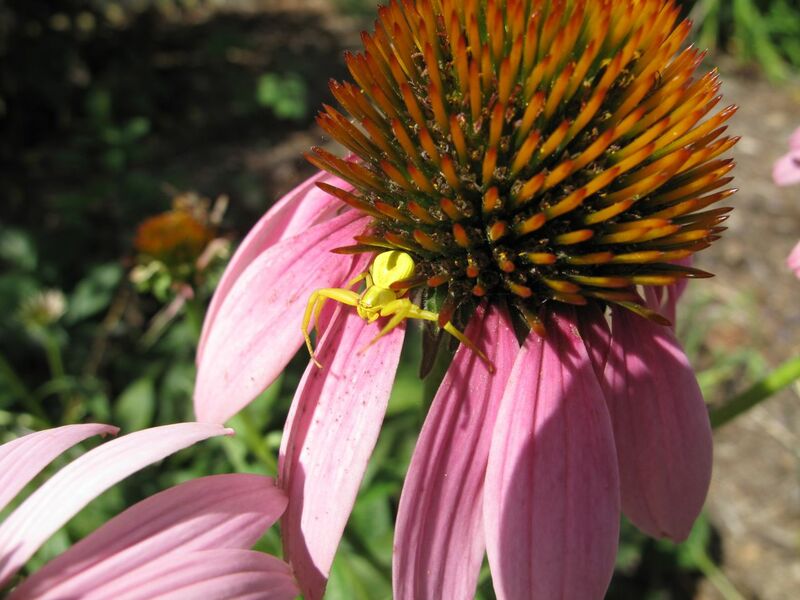 This little yellow spider, perhaps a flower crab spider, may be the same one I saw a week ago on this Echinacea purpurea (Purple Coneflower). 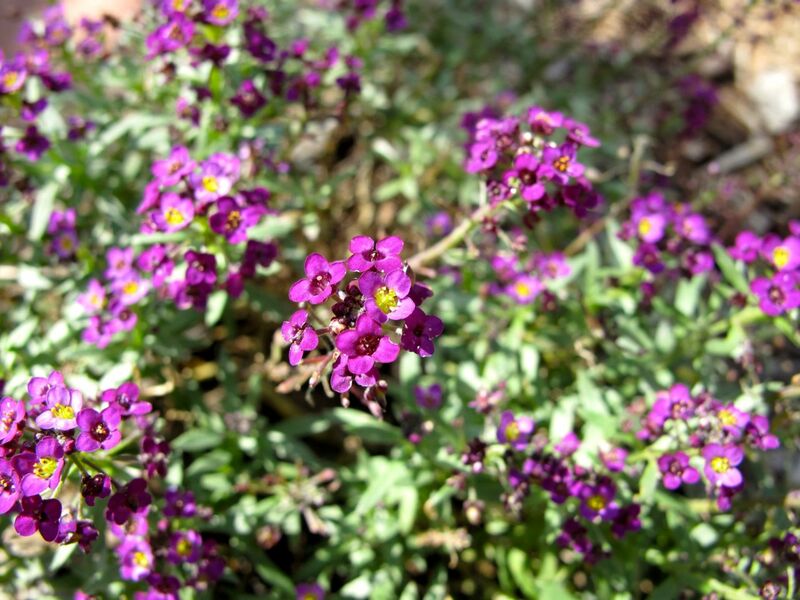 A white-flowerd Alyssum was a garden star last summer and fall but this Easter Bonnet Violet has been quite the opposite this year. Planted in late April, it is only now gaining some confidence. 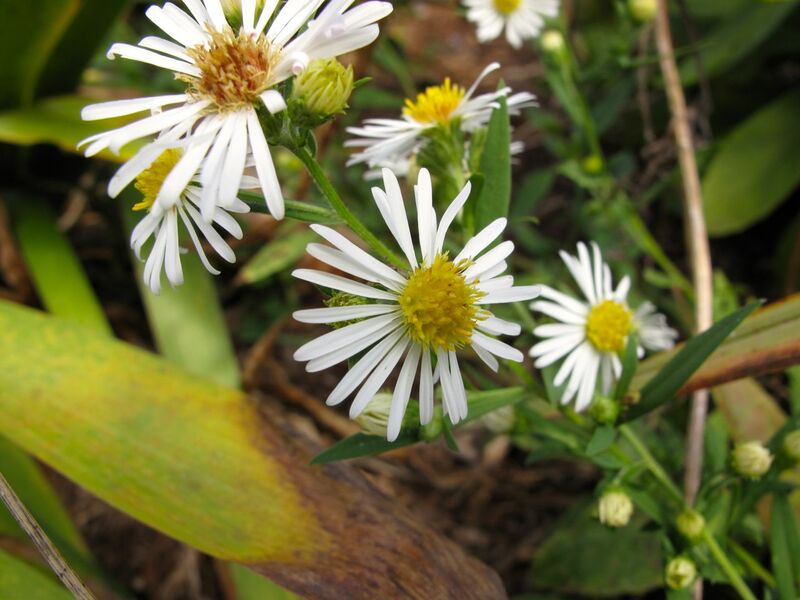 An unknown variety of Aster added to the garden when new, soon became unruly and spread so much I tried to remove it from the garden. It is defiant though and shows up year after year. 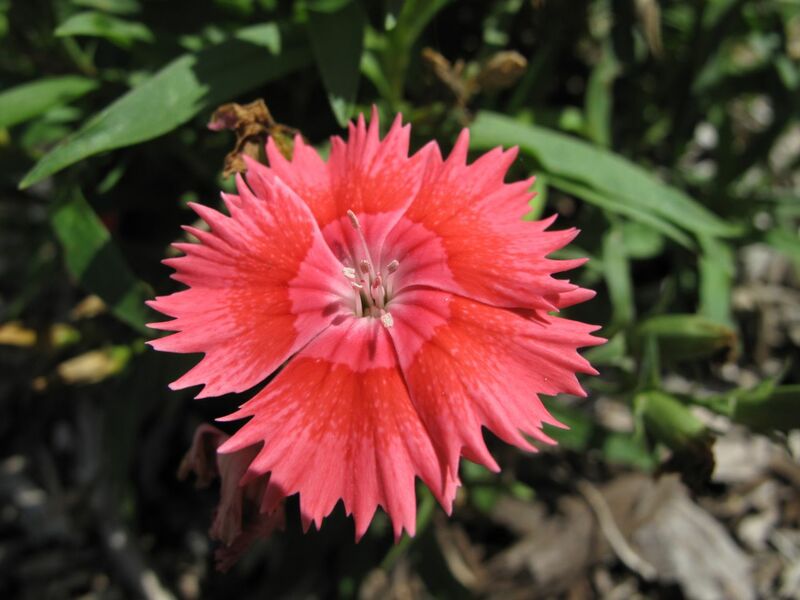 Salmon-hued Dianthus did well last year in the meditation circle. 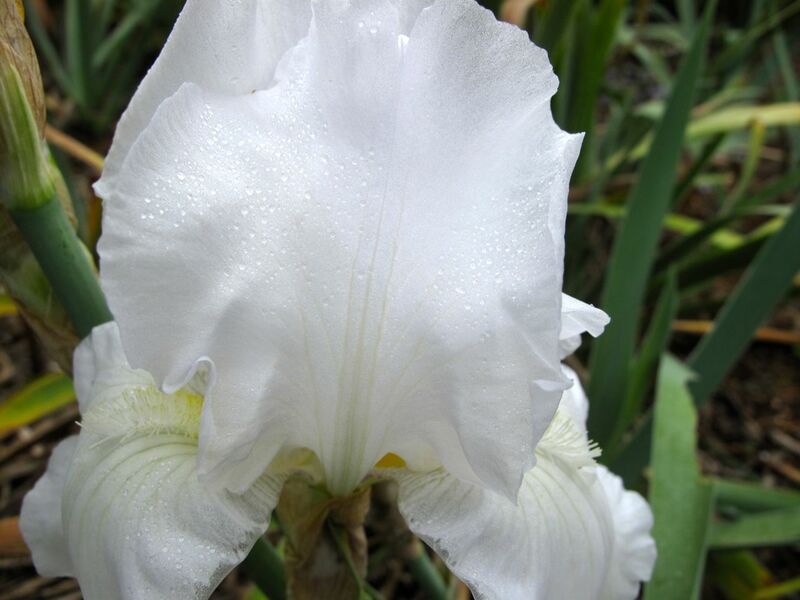 This year it did fine in spring, languished in summer and is now looking refreshed. 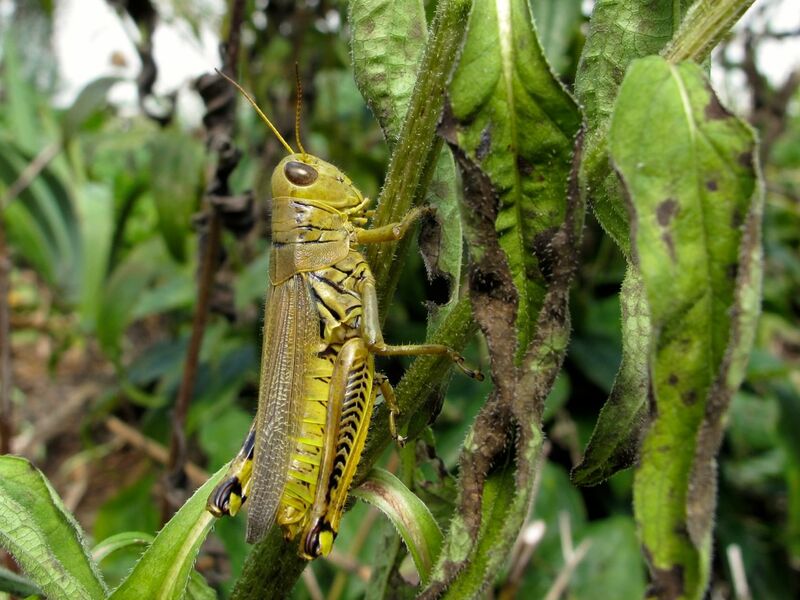 I came across an olive-green grasshopper standing firm and erect against an Echinacea stem and have tentatively identified it as a Differential grasshopper. 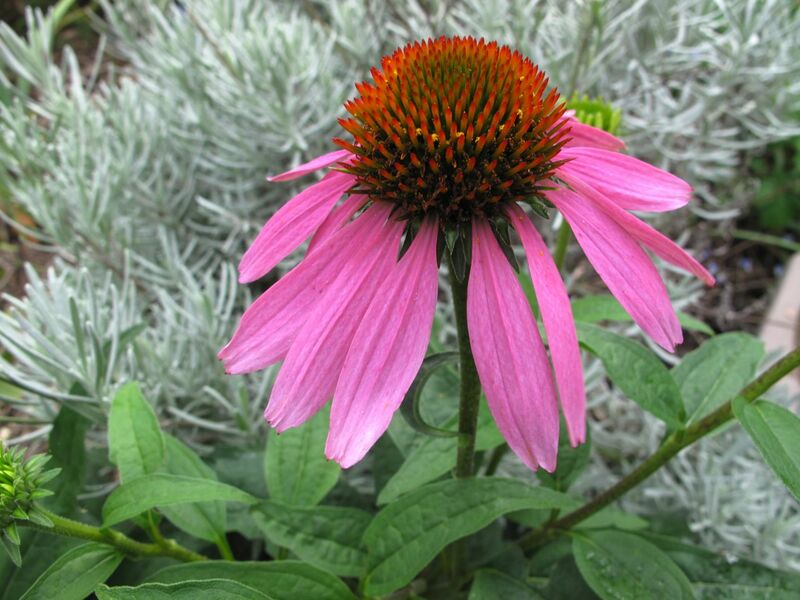 This entry was posted in garden and tagged Alyssum 'Easter Bonnet Violet', aster, autum, Dianthus, Differential grasshopper (Melanoplus differentialis), echinacea purpurea, Helianthus angustifolius (Swamp Sunflower) on September 23, 2013 by pbmgarden.